The salesman tells us that the Low Countries have not really warmed to the Internet. I begin to understand why. RAINING most of the daylight hours. Dining out with Jaenelle Antas is a delightful ordeal: we enter a lush restaurant, surrounded by elegant guests whose every eye swivels onto her, and the waiters scurry over and test what language she can understand them in -- none. They lay the leather-bound menus in front of her with a practised flourish. The prices, I note, read more like zip codes. These gourmet chefs then learn that this Minnesotan does not eat meat, nor fish, nor shellfish, nor vegetables; nor drink wine nor alcohol. As though to say, "Climb out of that one, Mister Waiter!" It is difficult for me to keep my temper, or a straight face, depending on my mood that evening. A DREAM-LADEN night: wild car chases. Fury at the Belgacom store in Leopold Street, who have sold us a Vodafone Internet "stick" three days ago. Their "four-day" card has expired after fewer than three, with thirty megabytes of download still unused -- the appalling woman at their customer service desk indicates that she could not care less. Her manageress comes over and shows the same attitude, and we are nearly bowled over by the stench of stale tobacco smoke that accompanies her. The Phone Store over the road sells us a fifteen-euro top-up, but that turns out not to work either once we hit the Netherlands this evening, despite what the Belgians said. So much for Vodaphone. The salesman tells us that the Low Countries have not really warmed to the Internet. I begin to understand why. THE DUTCH hotel charges six euros ($7.50) for just fifty minutes usage of their Internet, the minimum! Since they also charge for a skimpy breakfast, we flee hungrily at nine a.m.
We discover that our target for today, my old friend the historian Ministerialdirektor a.D. Fritz Tobias, will be home; we drive over to Hannover, Germany, arriving around midday. He is ninety-eight; a beaky, wiry, fit, alert-eyed old man, he appears unchanged from when I last saw him twenty or more years ago, writing on Joseph Goebbels. At first he orates fluently about the past -- his past, his wars with the Swiss Professor Walter Hofer, Edouard Calic, and other figures. The case of H W Wicks eventually comes to mind -- the danger of becoming fixated, obsessed with past wrongs done. He still thinks I am wrong about Adolf Hitler's partial ignorance on what Heinrich Himmler was up to. He has hundreds of ring binders lining the walls of his rooms. There is also an intimidating array, and for an author a frankly depressing one, of thousands of well-thumbed books suffocating the house, lining bookshelves everywhere. It is every wife's nightmare. Dr Baumgarten of the German Bundesarchiv is keen to acquire his whole collection, but says "we have no money." I tell him of the Erich Benndorf Collection in California, over which the Bundesarchiv dragged their feet for months, then informed me that the Innenministerium had now forbidden them to have any contact with me or through me whatsoever! He is agape. I find four of his binders of special interest, on Himmler and Reinhard Heydrich, and photograph some 370 pages of documents in them. In the 1970s Tobias struck up a cautious friendship with the former SS Sturmbannführer Hans-Hendrik Neumann -- now long dead (1994) -- who was Heydrich's adjutant from 1935 to 1939, and latterly director of Philips Germany. Neumann was never prosecuted or even interrogated by the Allies. He did gradually divulge good stuff in interviews with Tobias. So did Erich Sanders, who was beneath Josef Meisinger in Himmler's Kriminalpolizei, and knew a lot of inside detail about the 1938 General von Fritsch case. BY the time we both leave it is seven p.m. and T.'s lady friend -- who speaks English -- has arrived, a lovely old lady in her seventies, I would guess. I tell him he has Marcus Henneke to blame for my visit. "He said you wished I would visit once more," I relate. He chuckles. 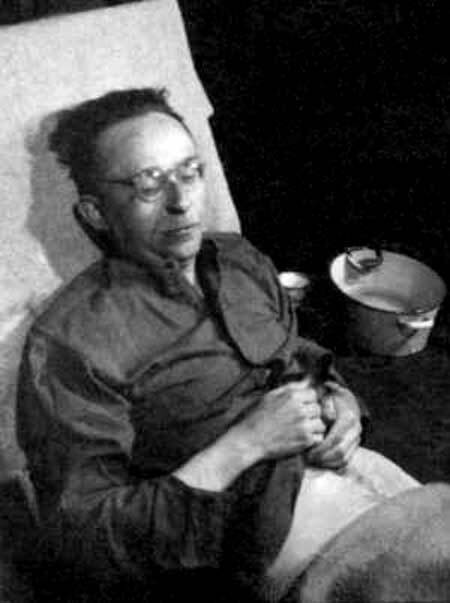 I am glad to say he has several sets of clippings covering the entire 1964 trial of Himmler's chief of staff SS Obergruppenführer Karl Wolff -- which ended in a fifteen-year sentence of which he served, I believe, ten: not easy for a man of his age. Tobias also had good access, as I did, to the secret files of the BDC; he tells me that Karl-Heinz Janßen of Die Zeit, our common benefactor, suffered serious brain damage in a road accident some years ago; he does not know what became of our mutual friend Heinz Höhne, the senior editor at Der Spiegel. His memory for names and dates half a century or more ago is extraordinary; of what happened yesterday, rather more vague. He is an outsider, loathed by the professionals who have ridden off slowly into sunsets of the past on their own commissions and committees, and know less about Real History than is in the scrapings under one finger nail. I have decided to risk visiting the Himmler death house in Lüneburg tomorrow, on our way up to Hamburg. Around ten-thirty p.m. we find a Landgasthaus south of the city and I work until one a.m. on the documents I have photographed. 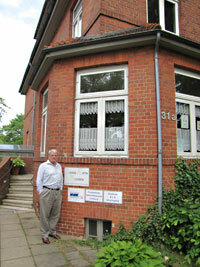 WE DRIVE over to Lüneburg early, to the house in Uelzener Strasse where death awaited Heinrich Himmler, No. 31a. Himmler was not the only top S.S. officer to emerge feet-first and blanket-shrouded from this sinister British Intelligence headquarters. No blue plaque on the wall records his brief stay. There are instead white enamel plates marking clinics and practices and meeting places of an evidently low-budget character -- an Alcoholics Anoymous group, a prostate cancer screening clinic, an Active Life group, Lange Aktiv Bleiben. "If you live for the moment, you will have a long future!" says its rather incomprehensible slogan in German. We walk up the six stone steps to the front door and press all the bell-pushes. Nobody answers. The building is deserted. We hang around taking photos and filming a brief report, , but not too long in case neighbours report a suspicious activity and a malheur results with the German police, Himmler's successors. The big front room where the terminal event in Himmler's forty-four year career took place faces east or south-east, so far as I can tell from the morning sun. There was therefore no light going into its bay windows at eleven p.m. that night from outside, from the moon and star charts I have seen. An important point. The houses to either side seem to be new, as do many of those around, so I guess that No. 31 was one of the few houses left standing when the British arrived in May 1945. The front room windows are high off the ground -- the window sill is level with the top of my head. I find it hard to understand how those Tommies including Sergeant Carl Sutton looked through the window and "saw Himmler's body lying on the floor," unless they knew what they were looking for and one stood on the other's shoulders. 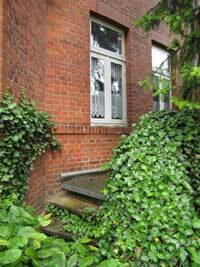 There is a shallow flight of steps up to the windows to the right, behind the tall conifer that has grown up in front unchecked since the war, and they may have used that. Jaenelle takes photos of the steps, although they do not afford any view into the front room -- either now or in 1945. We have driven through forests to reach the town, and drive through more when we leave. This is the Lüneburg Heath somewhere in which Himmler's remains still lie buried. "What kind of people bury a body in an unmarked grave in a forest," we muse, and answer it ourselves: "Murderers." No reason otherwise for the concealment and mystery. Nacht und Nebel. An invention of Himmler's own doing. 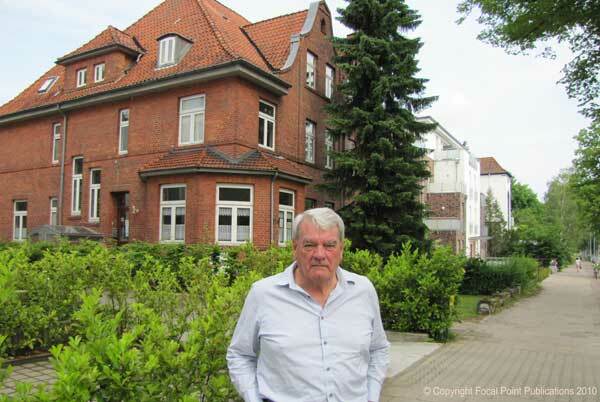 AT ELEVEN-THIRTY a.m. we arrive, equally unannounced, at the home of Gerd Heidemann, until 1983 one of the Stern magazine's greatest investigative journalists. He greets me as an old friend. There are 7,000 black ring-binders lining the walls of his apartment in Hamburg-Altona, all identical and meticulously labeled. He is very bitter about the "Hitler Diaries" forger Konrad Kujau (whom he knew under his alias Connie Fischer); the man had gleaned tidbits about the plane crash that killed Hitler's manservant Wilhelm Arndt and his personal pilot Flugkapitän Major Friedrich Gundelfinger in East Germany on April 21, 1945, and fed them back to Heidemann as evidence of the Hitler Diaries story. Everything that Gerd Heidemann researched was brilliant and true; then along came Kujau, this mehrfach vorbestrafter criminal, and sold him the fakes. He is bitter too about the judges at his trial, who refused to see the evidence of their own eyes proving that he was the innocent party in all this, trapped between an unscrupulous forger on one side and Stern's greedy and powerful editorial board. 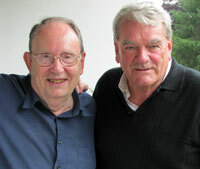 He is eighty now, and as talkative and as friendly as I remember him from 1981 and 1983. Wir dutzen uns noch. How time flies. His new wife Marianne, whom I have not met before, could not have been sweeter and willingly takes Jaenelle out to see the sights of Hamburg; this leaves Gerd free to reminisce, and me free to listen and to photograph hundreds of pages of his intimate tape-interview transcripts, above all with SS Obergruppenführer Karl Wolff, Himmler's chief of staff. Wolff sounds very croaky on the interview that Heidemann taped with him and Wilfried von Oven, Joseph Goebbels's adjutant, in Santiago de Chile, on July 5, 1979, but the recollections are very clear. He refutes a disbelieving Oven, who wants to push the blame for Reichskristallnacht (November 9,1938) away from Goebbels, his chief and Hitler's propaganda minister. First he, Wolff, had driven Hitler over to the Feldherrnhalle in Munich on the last stroke of midnight for the dramatic SS swearing-in ceremony in Munich -- just as I describe in my Hitler biography, having learned the details first-hand from Hitler's adjutants; this was the version so roundly condemned by Lipstadt's defense experts at her 2000 Trial for libel. All the adjutants and senior SS officers were staying at the Hotel Vier Jahreszeiten; Himmler however had gone over to be with Hitler at his apartment at Prinz Regentenplatz. After the SS ceremony Wolff had received an urgent phone call from SS Obergruppenführer Heydrich, chief of the RSHA in Berlin, saying that Heinrich Müller his Gestapo Chief (Amt IV) had just phoned with word that under the leadership of the SA Brownshirts, riots and fires were breaking out all over Germany in an organised revenge for the Jewish assassin's murder of the diplomat Ernst Vom Rath in Paris. Puzzled by Müller's report, Heydrich asked Wolff to check back with the Führer on this. Prompted by Goebbels, the gauleiters had evidently issued instructions for a pogrom, said Heydrich, and he was reluctant to countermand these in case it was Hitler's will. He begged Wolff to find out. Late though it was, Wolff hurried right over to Hitler's apartment. Housekeeper Anni Winter opened the door. He asked her if Himmler was there. He was. Frau Winter brought Himmler out and Wolff explained the problem. "Um Gottes Willen!" exclaimed Himmler, when Wolff told him of the nationwide rioting and disorders. "Und dabei bin ich der höchste Polizeichef Deutschlands!" (For God's sake! And I am the top police chief of Germany). Wolff explained to Himmler that they must tell Hitler what was happening. Himmler told him to step inside, and together they put it to Hitler. Both men could see, says Wolff, that Hitler was shocked at the news. He was horrified at the prospect, he now told Himmler and Wolff, of having to use the SS against the SA again, just as in June 1934. He strode up and down the other side of his apartment while they waited, snapping his fingers quietly -- a characteristic mannerism -- while he pondered the dilemma. After a few moments Hitler dictated to Wolff the order to be sent to Heydrich that the police were to see that the fires did not endanger buildings near the blazing synagogues, and that (Aryan) property was not damaged. "Meine SS hat fern zu bleiben," Hitler ordered, recalls Wolff: My SS has to stay out of it. Misreading the situation, "Gestapo"-Müller had meanwhile sent out a rather more drastic order, believing this must be Hitler's will; Heydrich rapidly corrected that. Himmler meanwhile set off on his month long vacation in Italy with his wife. TALKING of whom, Heidemann knows more juicy detail on the Dr Rascher case. Rascher had decided to marry a woman in her fifties who was an intimate friend of Mrs Marga Himmler. The woman produced at her advanced age first one, then another, and finally a third child. Naive beyond belief, Himmler boasted that this was a feat of which every German mother should be capable, but then Munich's veteran police chief Friedrich von Eberstein tipped off Karl Wolff with unsettling news: not only were the children not hers, she had actually stolen each child from outside school playgrounds. Eberstein was insisting that she be arrested. Frightened of upsetting Marga, Himmler demurred. Wolff tackled Himmler direct, remarking that he had always believed the SS to be a knightly Order, and not a band of "baby kidnappers": he demanded she be arrested. She went to a concentration camp, perhaps Ravensbrück, where she eventually died. All three children were returned to their rightful mothers. Her husband the infamous Dr Rascher (low temperature experiments on live prisoners) also came to a sticky end. Found to have taken a ten thousand mark bribe to arrange the release of a prisoner from Dachau concentration camp, he was sentenced to death and hanged. I will check the transcripts for Wolff's actual wording to get the story right. 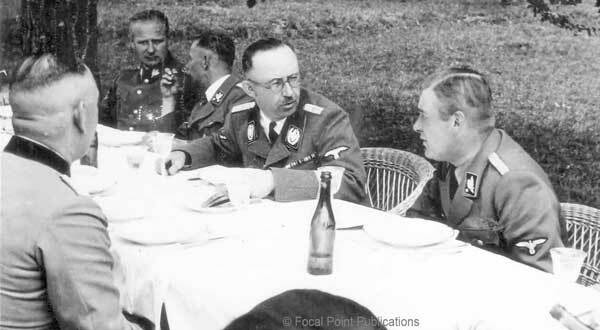 Wilhelm Höttl and a number of other junior SS officers visited Reinhard Heydrich at Fehmarn island once; he described how Heydrich actually stood to attention when Himmler phoned -- "Zu Befehl, Reichsführer! ", his heels together, bowing slightly each time like a Jew murmuring a prayer. Meanwhile his somewhat less respectful wife Lina stood behind him, making suggestive hip gestures, mimicking, "Zu Befehl, Reichsführer, Jawohl Reichsführer, Jawohl,Reichsführer! Darf ich Ihnen in den Hintern kriechen, Reichsführer! "- an inelegant reference to what Americans call "brown-nosing". Extraordinary. I must again check Höttl's actual wording. Hitler had only the one pale blue suit in the 1920s, his photographer Heinrich Hoffmann had told Heidemann. To minimize powder damage from Hoffmann's flash gun, he asked Hoffmann to take a whole set of "orational" poses in one session, and in future to issue one different picture for each speech he spoke at at. It was Hoffmann who suggested the special postage stamp royalty for use of the photo of Hitler's head when he came to power. It raised millions, and Hitler directed his staff to travel the country looking for worthy causes to support -- poverty stricken widows, etc. HEIDEMANN tells me that he too has been cheated by various German publishers, and that Gerd Sudholt in southern Germany has done the same, and he has also heard the horror stories about Herbert Fleissner's publishing methods. What is it with German publishers? Rolf Hochhuth told me years ago that he only found out by chance that Fleissner had published further editions of his book Kaisers Zeiten, without paying him. Returning at five-thirty p.m. Jaenelle reports that she has seen a policeman sniffing around our rental vehicle; it is probably quite harmless, but I decide to take no further risks today. At six pm we drive off north in heavy traffic toward Kiel. [Later back in Hamburg:] I spend four hours going through more of Heidemann's files. I would like to have paid him right away for his wonderful research help, but our cash is now down to seventy euros and we have a five-hundred mile drive ahead tonight. At five p.m. we set out for Belgium. Almost at once, just south of Hamburg we run into the worst traffic jam I have ever experienced, caused by a tour bus that has wrecked blocking the autobahn. The traffic stands stock still for ages, and then takes three hours to advance six miles before bursting free. I drive all night and we finally reach Knokke in Belgium at ten past six a.m., after thirteen hours at the wheel since leaving Heidemann's. It is too early to phone anyone. We doze in the car, have a rather expensive breakfast at a hotel, and [for various reasons] . . . find we have to abandon plans for the speaking visit to Paris. Jaenelle takes this change of plan on the chin. We drive on at once to Ostende, and book onto today's one-thirty p.m. ferry. An unfortunate end to what was otherwise a very successful raid on Germany, which could in certain circumstances have gone very wrong..